While everyone knows the new White Star liner was the most glamorous and was full of millionaires when she sank, few appreciate just how luxurious she was. Even in Third Class, the accommodation was better than on First Class on many older ships. For the first time, Bruce Beveridge, Steve Hall and Scott Andrews look at the ship itself, and at her interior design and fittings. From cobalt blue Spode china and Elkington plate silverware in the a la carte restaurant to the design of the boilers and fixtures and fittings onboard the world’s most luxurious vessel, they tell the story of a liner built at the peak of the race between the British, French and Germans to build bigger and better ships. The largest, most luxurious ship in the world, lost on her maiden voyage after colliding with an iceberg in mid-Atlantic, Titanic has become the stuff of legends. Built at the peak of the race between the British, French and Germans to build bigger and better ships, she was the achievement of 15,000 men in one of the world's most advanced shipyards. While everyone knows the new White Star liner was the most glamorous and was full of millionaires when she sank, few appreciate just how luxurious she was or how advanced her design was for her day. For the first time, Bruce Beveridge, Scott Andrews, Steve Hall and Daniel Klistorner look in detail at the ship itself, how it was built and what it was like inside. From the engine rooms to the First Class parlour suites, from the Doulton water closets to the cargo cranes, every area of Titanic is presented in stunning detail. Volume One covers the design and construction of Titanic, with individual chapters detailing such diverse areas as the riveting of the ship, her heating and ventilation systems, funnels, steering and navigation systems and more. Volume Two covers the interior design and fitting out of the ship and presents detailed deck-by-deck information, from the palatial rooms of First Class to areas of the ship seen only by the crew. 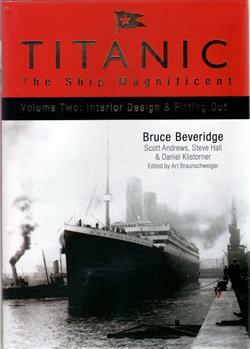 Titanic : the ship magnificent / Bruce Beveridge ... [et al.] ; edited by Art Braunschweiger. Stroud, Gloucestershire : History Press, 2008. 2 v. : ill. (some col.) ; 31 cm. Vol. 1. Design and construction -- v. 2 Interior design and fitting out.